Great for corporate events, Gala dinners, Balls, Awards nights, cocktail functions, wine and cheese events - or any other function. A mixture of songs in English, Latin and Medieval languages as well as popular songs played and sung in an ethereal style. Instrumental harp music, gentle flowing music from Spain, England, and New Zealand. Styles of music available are - Contemporary, Celtic, Early music, originals, love songs, Traditional and Christmas. Have a look at the repertoire page to see more about the music available. Set the mood for your event right from the start with elegant background music as guests are arriving and enjoying pre-dinner drinks and canapes. Harp music is perfect for setting a wonderful atmosphere at the beginning of your evenings entertainment. Dreamy ethereal music will fill the room and people will still be able to chat. "Many thanks Robyn for adding that something special to our intimate event. Your music and lovely singing were perfect for our evening and created the ambience we wanted. Not only was your playing very professional, you were also a pleasure to deal with." Robyn can also provide the perfect background music for dining. Your guests can easily talk and enjoy being entertained at the same time. Wonderful for your wedding reception, setting a romantic atmosphere - you can choose from contemporary songs that you hear on the radio, Celtic music or Medieval music. Easy to fit into most venues and never too loud for your guests as they are talking. The perfect accompaniment to any event. Create an elegant ambiance for your guests to enjoy. Your diners will have a special treat with harp music playing as they are eating. Many people have never seen a harp very close to them before and are intrigued by the instrument. Robyn has played in many different locations for dining events from Mystery outdoor locations accessible only by 4 wheel drive vehicles for a special car launch by Subaru in Reperoa to a Pop Dining event on the Devonport ferry in Auckland. Wherever your event is being held The harp can probably go and Robyn loves to travel. Anywhere in the North Island will be considered as the harp needs to travel by car. Robyn has played in Havelock North, Tauranga, New Plymouth, Hamilton, and as far north as Kerikeri. Themed events are a speciality and if you require a certain style of dress or need particular colours to match the theming of your event this can be arranged. Robyn loves themed events and you can be assured she will be enthusiastic about fitting in perfectly. Some themes where the harp would help to set a suitable atmosphere. . .
Great for Heaven and Hell themed events, St Matthews in the City is a great venue for this theme. Have an intimate event at the Seahorse room at Kelly Tarltons. Harp music is a wonderful addition to an elegant high tea. have an antique Victorian inspired afternoon tea party with tiers of pretty cakes and vintage teacups. Alberton House in Mt Albert, Auckland is a great venue for this theme, they have a lovely garden too. 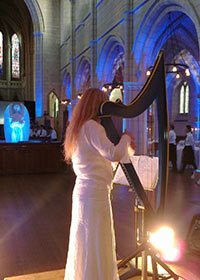 Harp music is the perfect choice for your Medieval themed dinner or function. Great for background dining music - subtle so guests can still chat but keeping your theme going in the background. Robyn has lots of Medieval and Early music in her repertoire - a mixture of songs in English, Latin and Medieval languages as well as popular songs played and sung in an ethereal style. Instrumental harp music, gentle flowing music from Spain, England, and France. Robyn has many Irish songs in her repertoire that are suitable for Irish or Celtic themed events. Harp music playing as people are arriving to a masquerade Ball will set the scene with elegant music. What could be more perfect than harp music - everyone knows that fairies love the harp! Lots of fun - Robyn has lots of songs in Latin and old Medieval languages for this theme. For your Christmas themed event Robyn has up to 3 hours of Christmas music from Medieval carols in Latin through to the well known favourites of today and many beautiful Christmas songs that are rarely heard. She can dress in Christmas colours of red and white to help theme the occasion. Robyn has lots of love songs in her repertoire and plenty of instrumental harp music to set a romantic atmosphere, great for restaurants and hotels. 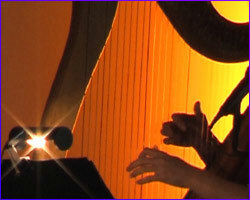 Beautiful Irish songs with harp - perfect at your function, restaurant or hotel. 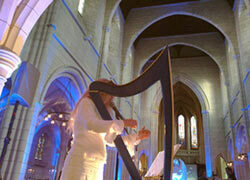 Harp music is a wonderful addition to your mother's day morning tea, lunch, afternoon tea or dinner event. Mum will love it! Birthdays - 30th, 40th, 50th, 60th, 70th, 100th!!! Harp is a lovely addition to your birthday plans and Robyn has played at many birthday celebrations. Great choice of live music as your guests can talk over the top of the entertainment. The harp is also a great talking point for your guests and often at intimate functions Robyn will be asked lots of questions by the guests who have never seen a harp close up. Particularly good for older peoples birthdays, afternoon tea parties and garden parties. If you are having party music, a DJ or band later at night think about having the harp music at the start of your party. Whether you are having an afternoon tea, an evening cocktail function, wine and cheese event or a full evening meal music is important for setting a warm and cosy atmosphere. It will be the icing on the cake. Make it a birthday to remember and be talked about for years to come! Ideal for corporate events where the harp will be going through a large P.A. Just plug in and let your sound engineer work their magic and you will have a room filled with gorgeous dreamy harp music that your guests will love! This harp can be played while standing, or the tripod stand can be removed so the instrument is played while the harp player is sitting on a chair - either way it sounds great! This pic was taken at a 'Heaven and Hell' themed event at St Matts in the City. Ceremonies of all kinds will be greatly enhanced with harp music. Wedding ceremony, Civil Union, renewal of vows ceremony, naming ceremony, ceremonies to mark a special event in your life, house blessings life milestones, recovery from a serious illness - anything important in your life that you want to mark with a special ceremony. Awards nights, opening ceremony, ceremonies to welcome new team members or farewell ones who are leaving, graduation ceremonies, harp music is an excellent background music option and will create a lovely warm and welcoming atmosphere at a more formal ceremony. Harp music is a popular entertainment choice for naming ceremonies, children love the harp and are always enthralled with the music. A harp must seem huge to a small child and the look on their faces is priceless! Up to 3 hours of songs, with a small amount of instrumentals mixed in. Up to 2 hours of instrumental music. Up to 3 hours of Christmas songs. 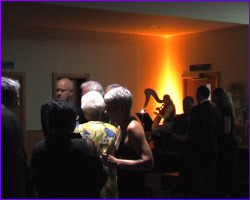 Background music for pre-dinner drinks as guests arrive at the 2006 Massey University Graduation Dinner. at the Sheraton (now the Langham) Hotel, Auckland featuring Trelise Cooper. "My client was very pleased with the result - you could have heard a pin drop when Robyn began to play!" MOTAT, Carnival Australia, SERO, Madant Productions, New Zealand Breast Cancer Society, West Auckland Hopsice, Waitakere City Council - feature artist at the 2006 'Trash To Fashion', Orange Productions, Laura Ferguson Trust, Auckland City Council - Festival of the Roses, Events Creative, Massey University, Unitec Technical Institute, Dawsons Catering, Kelliher Estate - Puketutu Island, EventMakers, Soljan's Estate Winery - Kumeu, Ascension Vineyard - Matakana, Avenues Event Management, Goode Events, Creative Juice, The Total Event, TVNZ, Hotel Du Vin - Pokeno, The River Lodge - Reporoa, Cerebos Greggs. Below are some comments from people who have organised events that Robyn has played at. You can read more on the references page. Many thanks Robyn, her beautiful instrument and her stunning voice were the perfect addition to our event. Robyn was able to handle with grace and style the attention of all, and also to perfectly blend with the relaxed and upbeat vibe of the dinner. As well as her presence and wonderful musicianship, she was an absolute pleasure to deal with from the very early planning stages to the end of the event. I would have no hesitation in wholeheartedly recommending her for your next event. It was a perfect fit for our event and location. I was delighted with the harp music and thought it gave a lovely atmosphere to the occasion. Just enough and not intrusive at all. I think everyone enjoyed themselves as we are all still talking about it. Certainly left me with many happy memories. Cotter House and your music made it a very memorable experience which I shall always treasure. Your performance was superb thank you. You played and sang beautifully and you looked stunning. I am most appreciative of what you gave to the VAC and I hope you were able to enjoy the night after you performed. Thank you once again. Renewal of vows ceremony onboard the Sun Princess cruise ship with Captain Stubing from 'The Love Boat' as celebrant. Thank you for your email and thanks again for the wonderful performance on Wednesday. We will definitely hold onto your contact details for future events. Robyn, thankyou for providing such elegant background entertainment for the pre-drinks function of Massey University's Defining Excellence Awards, held at Eden Park recently. 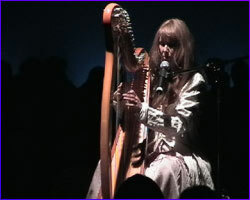 The mix of harp with vocals was a perfect choice for what was the start of a very special evening. "The music was very tranquil and created exactly the right atmosphere that we wanted. It made people feel relaxed and comfortable. Excellent mood - would highly recommend to those wanting this type of atmosphere." "On behalf of the Asia Pacific Parliamentary Forum (APPF) Organising Committee I am writing to thank you for your involvement in The APPF Official Dinner, held on 22nd January 2008 at the Auckland Museum & hosted by the Prime Minister. The delegates & organisers really enjoyed your music & felt the sounds of the harp created just the right atmosphere & set the right tone for the evening." 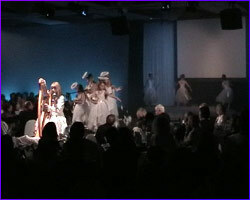 As one of the key performance artists at the 2006 Trash to Fashion Awards, Robyn Sutherland's unique voice and harp, woven throughout the show, treated the audience to something truly special. Musically brilliant, with a voice and presence on stage that is both ethereal and divine, Robyn is both beautiful and charming. Her live performance is all over magnificent, spiritually uplifting even, but her music is just as powerful heard on CD in your living room. School of Architecture UNITEC Pt Chevalier, Auckland. The theme was one of Medieval opulence & her beautiful voice & exquisite harp playing fitted perfectly. more customer comments on the references page. . .